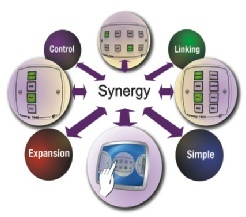 A range of controllers that offers much more than the individual parts – true Synergy! Quick and easy programming, combined with extensive onboard facilities and simplicity of expansion, are key benefits of this innovative new range of controllers. To be launched at ISE 2011 the Synergy range from iKON AVS offers control panels to provide solutions where simple, easy to install, and easy to operate panels are required. Synergy controllers are available in a number of formats to provide cost effective, easily configured control with a comprehensive range of onboard facilities. But being an iKON product that’s not all, as all Synergy controllers can be expanded with both software and hardware to provide a wide range of control and interface options including Touch Control, Ethernet Control and BMS interface. There are three base models, the 2080, 1080 and 1040. All configured using Windows™ based software that provides effortless drag and drop programming. What sets the Synergy range apart is the fact they are designed with European market in mind and offer ultra reliable and affordable control, with expandability, in the range. A bi-directional RS232 port provides control over displays and other RS232 devices. Two IR ports can support either single or dual IR emitters for control of devices such as amplifiers and players. RS232 and IR commands can be loaded from the embedded libraries or user created files. Two outputs provide control of external relays and indicators. These can use the built-in screen control, projector lift and power control routines, or to operate other devices. 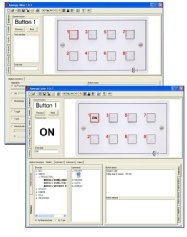 Two inputs are available for use with external buttons; either operating in parallel with the panel or as extra buttons. They can also be used for room detection with a PIR detector or for external enable and system power-down. The Syn-Link port provides linking of panels in multi-room systems, connection to Synergy peripherals, or control from a PC. This port can also be upgraded to operate as a second bi-direction serial port for control of other equipment. The panel will fit a standard depth UK back box and is provided with detachable screw terminals for ease of installation.